A large percentage of the masts we produce are not for classes or One Designs, but are unique, one-off builds. The total flexibility in using wood, as opposed to alloy, appeals to the imaginative yacht designer as the traditionalist who would have none other. The craft vary from custom-built yachts constructed in large, commercial yards to dinghies built in the garden shed with the aid of a book and lots of enthusiasm. Modifications and improvements to existing designs are also very common, as well as easy to incorporate during the construction process. 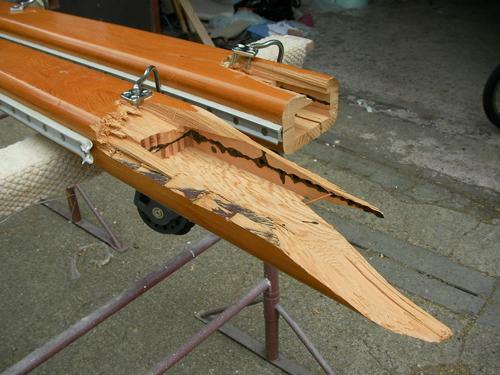 If you are considering a replacement wooden spar and are not sure of the class, or perhaps like the concept of changing a sloop into a gaff that has taken your fancy, we will be able to help. To enable us to establish exactly what you require, we need some basic measurements and information so we can put together a specification on which to quote. Type of rig; fractional, gaff, sloop etc..
Fitting at top - sheave or button etc. Fitting at base; keel, deck stepped tabernacle etc. Main section - tapered, parallel etc. Ironically, it is not so much the length of spar which is of most importance, but the section. Knowing the maximum diameter size of the spar will enable us to establish the most suitable construction method, as well as the number and size of all the component parts. Working within standard balks of timber is necessary and key to any costing.